December brings us spectacular night skies and arguably the richest meteor shower of the year, the Geminids. We still have the Summer Triangle of bright stars, Vega in Lyra, Deneb in Cygnus and Altair in Aquila, high in the south-west at nightfall while the unmistakable figure of Orion dominates the midnight hours, surrounded by his cohort of familiar winter constellations. By the predawn, the Plough sails overhead and the night’s only conspicuous planets shine to the south of east. Our longest nights, of course, occur around the winter solstice when the Sun reaches its most southerly point in its annual trek around the sky. This occurs at 16:28 GMT on the 21st when Edinburgh’s night, measured from sunset to sunrise, lasts for 17 hours and 3 minutes, which no less than 10 hours and 39 minutes longer than at June’s summer solstice. By our map times, the Summer Triangle has toppled low into the west and is being followed by the less impressive Square of Pegasus. The Square’s top-left star, Alpheratz, belongs to Andromeda whose other main stars, Mirach and Almach, line up to its left. A spur of fainter stars above Mirach leads us to the Andromeda Galaxy, whose oval glow reaches us from 2.5 million light years away. Orion is in the east-south-east, his Belt pointing up Aldebaran and the Pleiades in Taurus and down to where the brightest nighttime star, Sirius in Canis Major, rises less than one hour later. The Moon lies to the right of Aldebaran and below the Pleiades on the night of 2nd-3rd, to the left of Aldebaran a day later and comes around again to occult the star in the early hours of the 31st. We need a telescope to see Aldebaran wink out at the Moon’s limb at 01:01 and reappear at 01:57 as seen from Edinburgh. 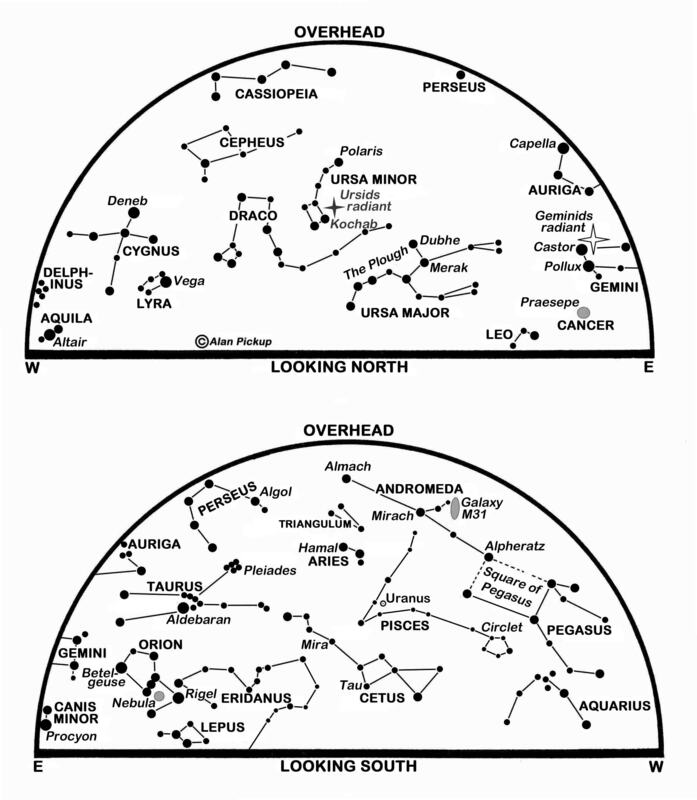 It is from a radiant point near Castor in Gemini, north-east of Orion, that meteors from the Geminids shower diverge between the 8th and 17th although, of course, the meteors fly in all parts of the sky. With negligible moonlight this year, and given decent weather, we are in for a stunning display of sparkling long-trailed meteors whose paths point back to the radiant. Rates for an observer under an ideal dark sky could peak at more than 100 per hour at the shower’s peak on the night of the 13th-14th, though most of us may glimpse only a fraction of these. Although most meteors originate as cometary debris, the Geminids appear to be rocky splinters from the 5 km-wide asteroid, Phaethon, which dives within 21 million km of the Sun every 523 days. In what is its closest approach to the Earth since its discovery in 1983, Phaethon sweeps only 10.3 million km from the Earth on the 16th when a telescope might show it as a tenth magnitude speck speeding past Alpheratz. December’s second shower, the Ursids, derives from Comet Tuttle and is active between the 17th and 25th, peaking on the 23rd. Typically it yields fewer than ten meteors per hour so I rarely mention it here – I believe my last time was 37 years ago – but very occasionally it rivals the Geminids in intensity, if only for a few hours. The radiant point lies near the star Kochab in Ursa Minor and is plotted on our northern chart. The unprecedented interstellar asteroid, discovered using a telescope in Hawaii and featured here hast time, has now been called 1I/’Oumuamua. This indicates that it is our first known interstellar visitor and employs the Hawaiian word ’Oumuamua to reflect its supposed status as a scout from the distant past. Further observations imply that it is remarkably elongated, being at least five times longer than it is wide. Venus shines brilliantly at magnitude -3.9 very low in the south-east as the night ends, but is soon lost from view as it dives towards the Sun’s far side. It leaves Jupiter as our most prominent (magnitude -1.7 to -1.8) morning object. The giant world rises at Edinburgh’s east-south-eastern horizon at 05:31 on the 1st and 04:07 on the 31st, climbing southwards in the sky to stand some 15° high before dawn. Tracking eastwards in Libra, it passes 0.7° north of the celebrated double star Zubenelgenubi on the 21st. Mars, fainter at magnitude 1.7 to 1.5, lies 16° above-right of Jupiter on the 1st when it is also about half as bright as Virgo’s star Spica, 3° below and to its right. As Mars tracks east-south-eastwards from Virgo to Libra it almost keeps pace with the Sun, so that it rises at around 03:50 throughout the month. By the 31st, it stands 3° from Jupiter, with Zubenelgenubi below and to Mars’ left in the same binocular field of view. The waning Moon forms a nice triangle with Mars and Spica on the 13th and with Mars and Jupiter on the 14th. Saturn sets in our bright evening twilight as it heads towards conjunction beyond the Sun on the 21st. Mercury slips around the Sun’s near side on the 13th to become best placed as a morning star between Christmas and New Year. Between the 21st and 31st it brightens between magnitude 0.8 and -0.3, rises 100 or more minutes before Edinburgh’s sunrise and stands around 8° high in the south-east thirty minutes before sunrise. This is a slightly revised version of Alan’s article published in The Scotsman on November 30th 2017, with thanks to the newspaper for permission to republish here.